- Best suited to today's modern women. - Who have hectic schedule and have very little time to look after their skin. - Suitable for all skin types and it is specially formulated to moisturize and instantly style your skin. 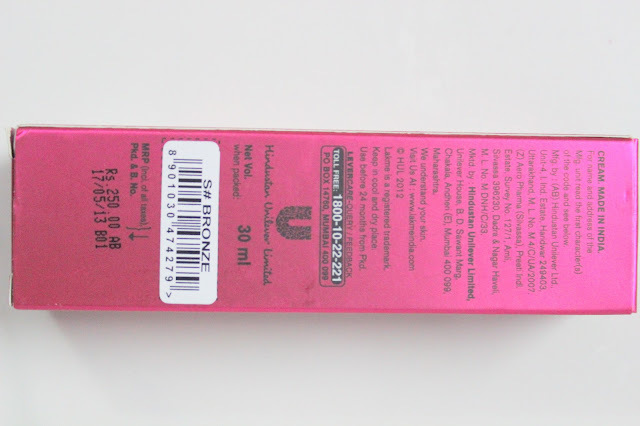 - It contains SPF 20 that ensures sun protection and brightens and refreshes your skin. - Best suited for the Indian skin tone. - Available in two shades – Beige and Bronze. - Light formulation ensures that the cream is easily absorbed into your skin, instantly giving it a perfectly even tone that looks natural. 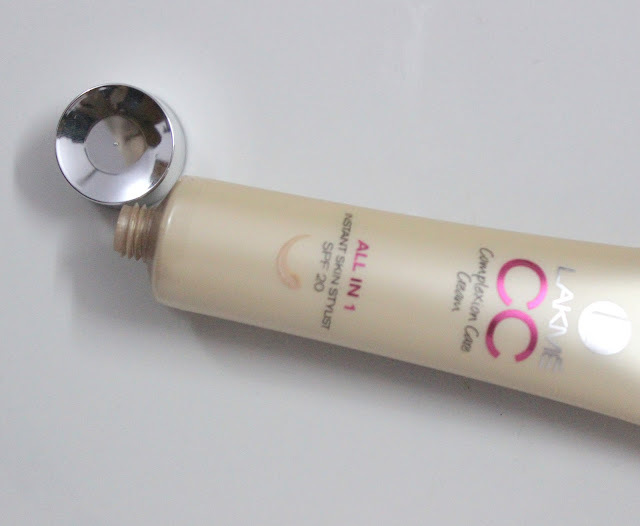 Lakme CC Cream is creamy and thick in texture and comes with subtle scent. 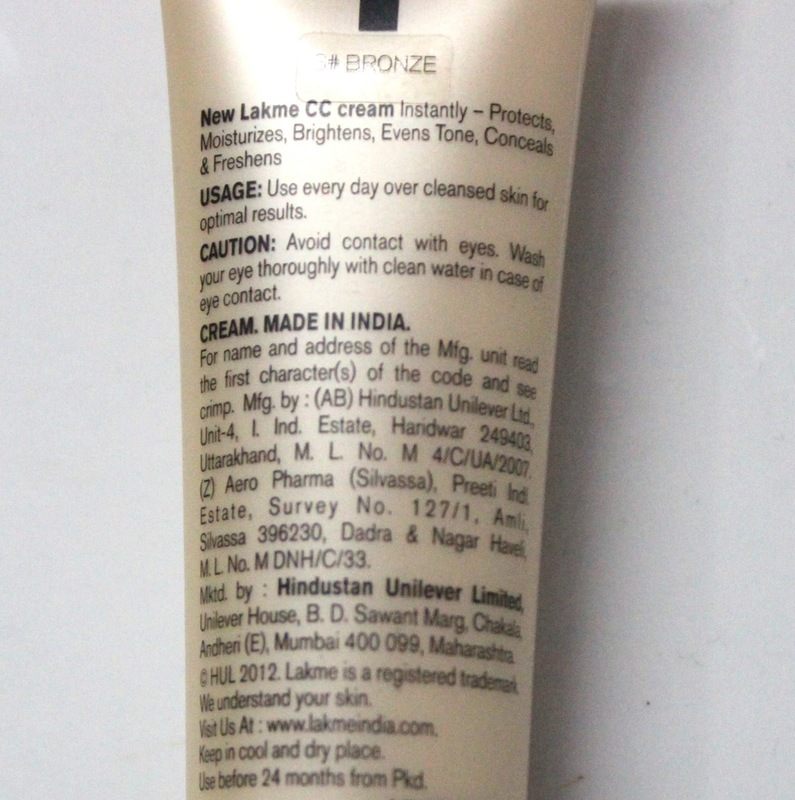 If you have used Lakme Sunscreen lotion that used to come in tube then you'd be able relate the scent. It smells exactly like that. There are 2 shades available - beige and bronze. The names suggest that "beige" is for lighter skin tones and "bronze" is for medium to dark. I chose "bronze" for my medium/dusky skin tone that thoroughly suits. I used "bronze" on one of my friends face who is one shade darker and surprisingly it blended well on her skin too. I found pigmentation to be decent when swatched on back of hand or face, making me feel that it will cover all flaws and blemishes. But the truth is that it gives medium coverage to face, not cakey at all, and you can build it up to cover blemishes and need setting powder. BUT it is NOT required. You want a cream that hides the flaws on your face without making it made-up in form of BB or CC cream. Otherwise choose a foundation. This minimizes the pore appearance, making skin look smoother. Lakme CC cream gives healthy glow to face that I have become a fan of. It is lightweight formula, feels like you are not wearing anything on your face but mirror tells you that you are! because of that glow. It stays all day long. I found that it makes my nose oily but that is because I always use a moisturizer before applying a tinted moisturizer or BB cream and this is what I did with CC cream. But I agree that you do NOT need additional moisturizer if you have oily skin and can work with water based moisturizers if you want to. For dry skin people, go for a good moisturizer regardless of how hydrating CC cream is. I didn't do outdoor stuff after wearing it, if I did I think the humidity and hot weather must have washed it off. It means it might require re-application, however, I am still not sure if it would wash off or not. 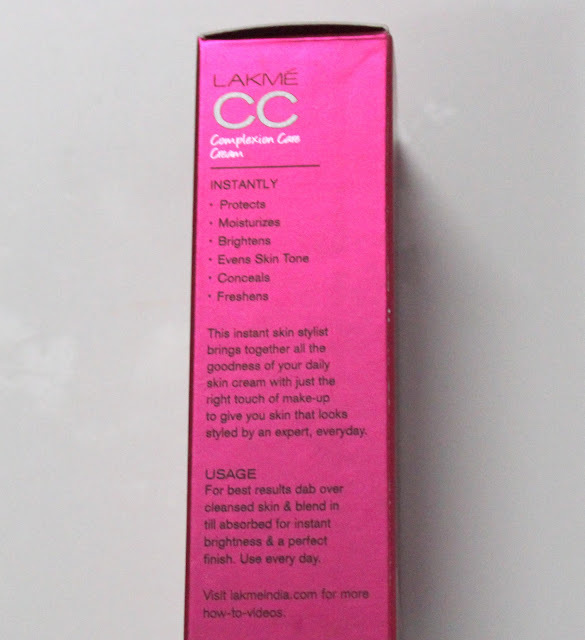 I use fingers to apply Lakme CC cream and it does a pretty good job. I also think that "fingers" would be the most suitable as brushes tend to take more product than fingers. At the end, it's your decision. You need 7 dots application for face and 4 dots on neck. you are good to go! The finish, I'd say, is flawless, even and glowing. It is not patchy. Love it. I'd say it is suitable for all skin types because it did not irritate my sensitive skin. The quantity and quality of product are worthy of INR250. 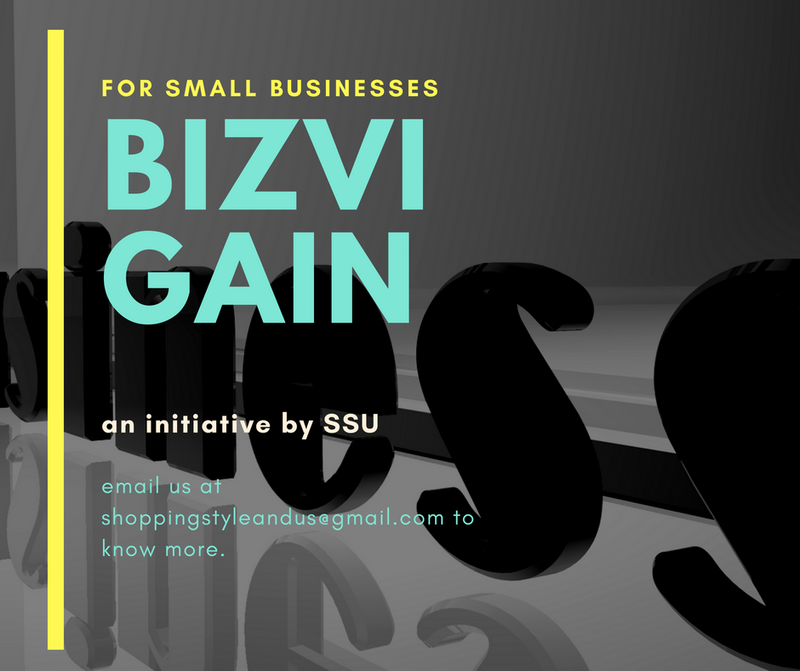 - A good amount of product and a quality product in just 250 bucks. - Takes little for the whole face and neck. - doesn't irritate my sensitive skin. - A product that doesn't need a lot of efforts in terms of blending, application and maintenance. - Stays all day long in air conditioned or non-air conditioned indoors. - SPF is an added benefit. Let's welcome such products. 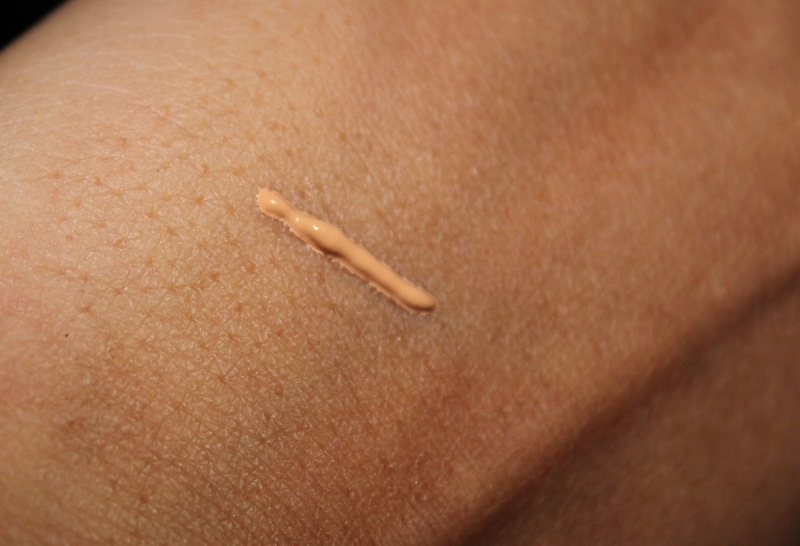 - Sheer to medium coverage, hide the blemishes buy applying more product or use concealer. - Only drawback could be just two shades for light and dark skin tones. However, I haven't heard of any BB or CC cream that has a lot of options available. However, you can find 5 CC creams with more than two shades listed here with details. 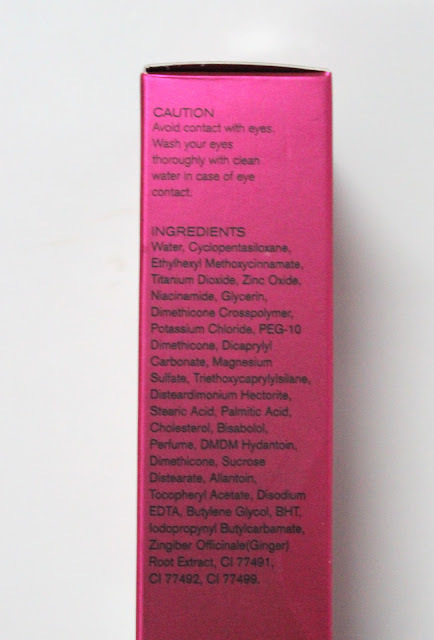 A Note to the Brand: -Thanks Lakme for introducing such a nice product. 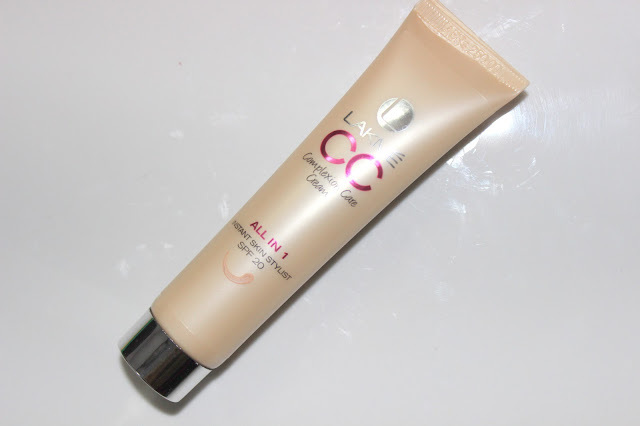 i hadn't been able to gulp down the idea of BB cream which still doesn't stand infront of Korean BB creams, but I am loving CC cream to the core. 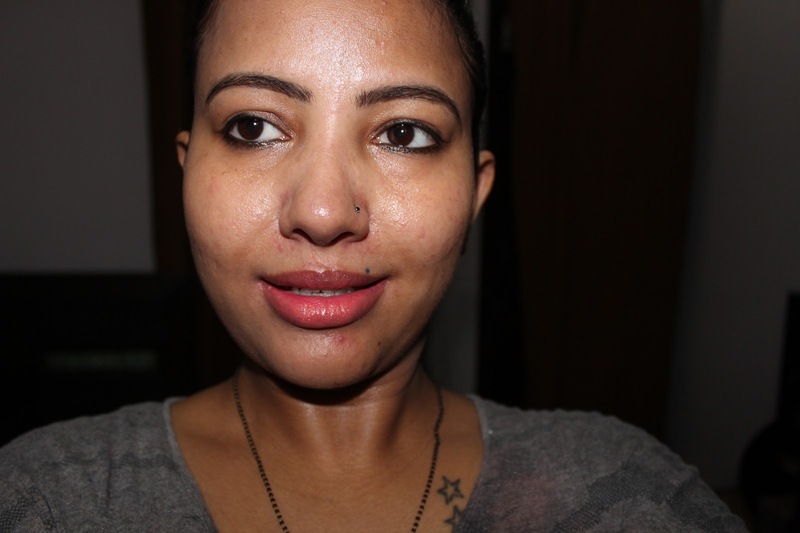 I have never been able to apply any tinted moisturizer, BB cream or anything for that matter in my day to day life. But CC cream has made it past. I use it every day and love it. 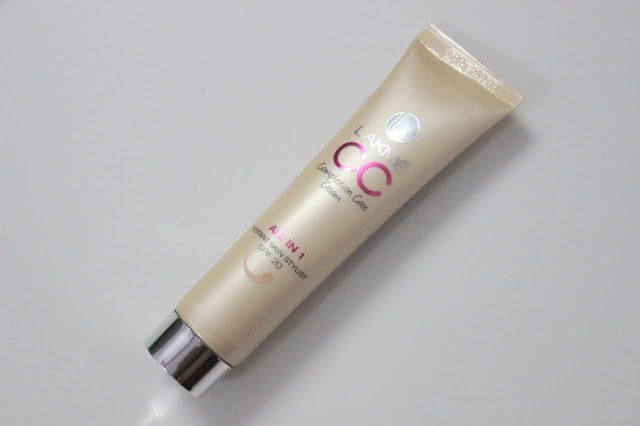 To you all - If you try CC cream, do let me know your likes and dislikes. would love to know. 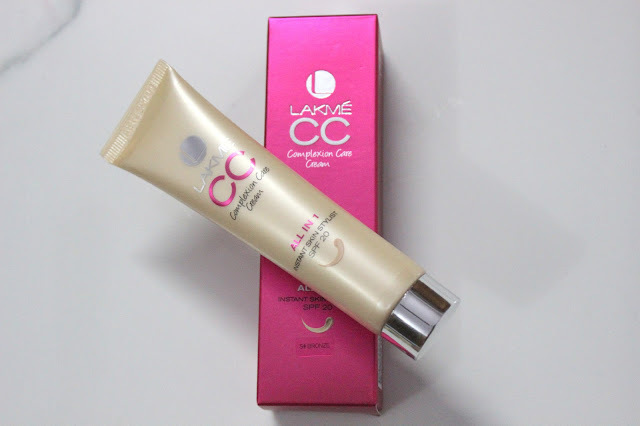 - What is CC Cream and How it is different from BB Cream? 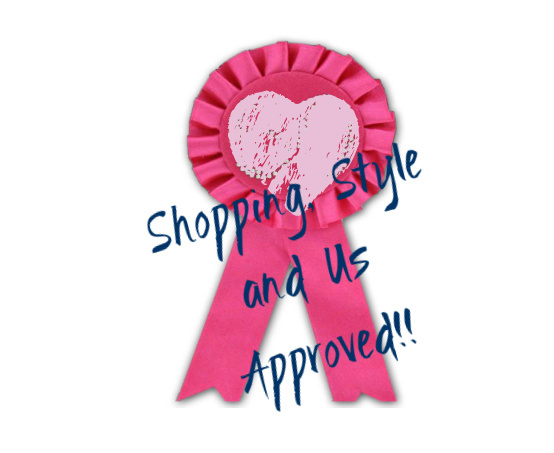 Disclaimer: The product was bought by Shopping, Style and Us for review.